It’s time for an anime that is nostalgic in a sense. I played the original Devil Kings game a while back which is what this arc is based off of. Admittedly, I can see how the game would sell better with that title over Sengoku Basara as it just seems a little more intense. The anime did a great job of adapting it and was just about perfect. It was a really well done anime all around and I look forward to seeing how good the sequels are. This will be a tough season to follow though so I can’t say that I’m expecting it to be surpassed. I look forward to seeing it try to prove me wrong though. The series takes place back in the really old days of warring nations of Samurai. There are many factions along the land and they feud over territory all the time. Despite this, many of them have fairly friendly relations with each other. They don’t hold grudges over destroying each other because it is simply their way of life. Whoever wins, there are no salty losers. That being said, it all changes when the Oda army descends onto the battlefield. They are led by the infamous Devil King who has no such compassion or morals on the battle field. His army doesn’t play by any set of rules and believes in winning at all costs. The heroes of each warring faction must either team up or face annihilation. This is one of those series that has multiple protagonists through the different factions. Some of them are clearly evil while others are more heroic. You ultimately have to decide which group to root for. There are 3 main heroic factions to choose from with Yukimura’s getting the largest focus. That was where my allegiance was since he is easily the best character in the series. I did like Masamune a lot as a runner up though and the show did a good job of giving everyone a good amount of screen time. Before talking about the show any further, lets delve into the characters. Yukimura is the headstrong protagonist whose fire abilities really enhance his fighting style. He has absolute confidence and never backs down from a fight. In fact, the moment that solidified him as the best character for me was when he didn’t even back down from the Devil King even when Masamune was frozen in fear. It was the deciding moment between the two and Yukimura passed the test. He may not have done too well against Mitsuhide, but you can’t win em all I suppose and the power levels were wonky by the end. More on that in a bit though. Having Ichigo’s English voice actor also helped a bit as well. Yukimura is one of the best main characters that I’ve seen in a while. He’s honorable, a great warrior, and he has fire abilities. Fire is the best element so that’s always a good sign. Shingen is Yukimura’s boss and he’s a reasonable leader. He definitely gives Yukimura quite the beating over the series, but the main character is very tough so he can take it. I can’t say that I ever found him to be all that strong compared to Yukimura and Masamune since he is really lacking in speed, but he is still one powerful dude. It would have been nice if we could have seen him get a full fight as Shingen never really got the opportunity. Sasuke is the ninja in the fire squad and he gets a lot of subtle hype. He’s very quick and knows how to get out of a dangerous situation. He never gets into any danger or even ends up nearing a loss. Sasuke is essentially untouched during the whole season so I’d like to see him help out more next time. Masamune is the big rival in the series and the second best character. His design is really good and his intense personality is fitting for Yukimura’s rival. He also enjoys combat quite a lot and it’s impressive that he’s the leader of his clan at a relatively young age. He gets a very large role during the course of the show. While Masamune may have overreacted at his first defeat and had to be snapped out of his stupor, he made a full recovery. I dare say that the show even hints that he may be slightly stronger than Yukimura. At the very least, he did look a little better against Mitsuhide, but Yukimura wasn’t in the right mindset for that one. Masamune’s 6 sword style was definitely unique even if it’s hard for me to imagine someone using it effectively. That’s a lot of swords after all, but it shows just how good he is. Kojuro is Masamune’s general and the two are pretty close. 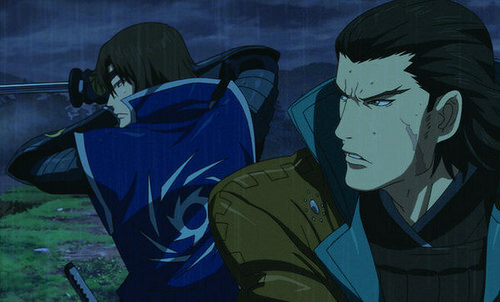 Kojuro will defy Masamune occasionally if he thinks that the leader is going down the right path. The leader may not like it at the time, but that’s exactly the kind of person that he wants as his second in command. Kojuro is also a pretty strong fighter in his own right. I don’t think he should really be a match for someone like Mitsuhide, but he’s probably the strongest secondary fighter in the series. His strategic knowledge is just as useful during this war even if Masamune does ignore it for a more direct plan. Kenshin was another one of the leaders, but he was a little disappointing. He only got to very briefly fight for about a minute or so before being taken out of the equation and all he did was talk. His rivalry with Shingen even felt out of character with the rest of his personality. Honestly, the guy was just a little more on the annoying side and while he may not be a bad character per say, it did feel like he was stringing Kasuga on for a while. Kasuga is his 2nd in command and the head ninja. While she could have had potential as a strong mercenary like Nina Williams of Samus Aran (Bounty Hunter anyway) the show mainly just uses her for fanservice. She is out shined by Sasuke whenever the two characters meet and she also just ends up failing in all of her fights. As she is a professional ninja, you’d think that she could defeat the Devil King’s wife. Kasuga even got her in a choke hold, but then she allowed Nohime to get free and shoot Kenshin. Honestly, that was probably one of the most embarrassing moments in her career. The only moment that may have been worse was when she got one shotted by Nohime again while trying to avenge her master. Kasuga fans definitely won’t be pleased with her portrayal and rightly so. She’s usually a pretty strong character, but she wasn’t given any respect in this season. 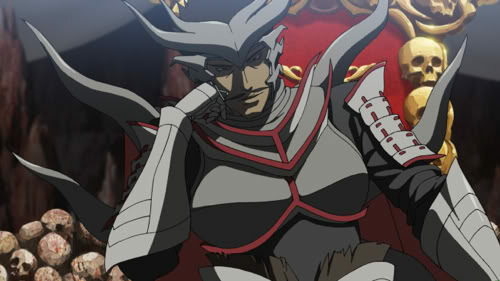 Nobunaga or maybe I should say the Devil King, makes for a great villain in the series. He doesn’t appear right away, but still manages to make his presence known the instant that he appears. His theme is absolutely amazing and he is really a perfect villain. He’s absolutely ruthless as well as a brilliant tactician. He didn’t get to where he is by being naive and manages to double cross his lieutenant before he was back stabbed. It was a great moment because being outsmarted would have really hurt his character. I also like the fact that he actually has super powers of his own and that allows him to fight with his gun, cape, and a sword of course. A gun wouldn’t be very useful against most opponents, but since the Devil King is naturally powerful already, he can make it work. He’s one step ahead of the heroes for the bulk of the series and it was even a little surreal to finally see him take to the front lines at the end. Nohime is his wife and probably the only person that he can count on. She’s pretty skilled as she infiltrated one of the hero groups and took out the leader. She also managed to defeat Kasuga pretty easily and just did a really good job of backing up the Devil King overall. She only went down due to plot hax. Unfortunately, that meant that we could never see her get a full fight as her other battles were mere skirmishes. Mitsuhide Ranmaru really got the shaft from the villains. He’s a kid who is working with the villains, but his backstory isn’t developed here. He can shoot arrows, but that’s about it so he is incredibly out of his depth here. I can’t say that I liked the kid at all so I was glad that the writers threw his character to the curb. Oichi is Nobunaga’s sister and he used her to entangle the clan leader Nagamasa into their ranks. As her husband, Nagamasa decides that he has to help the villains even if his whole shtick is that he fights for justice. It’s a shame since he is always talking about justice, but his honor gets in the way. That was pretty terrible to be honest and then when he finally decides to betray the Devil King, Oichi is used as a hostage. She puts up no resistance though and constantly makes things tough on him. I actually liked Nagamasa so his whole plot was pretty tragic. Oichi’s a pretty terrible character though. She spends the majority of her screen time on the floor telling everyone to forgive her and asking the Devil King to turn into a good guy. Naturally that was not going to happen and he makes it clear several times that she is expendable. She almost dies a number of times as well. Oichi does have some Devil King abilities within her as well like when she destroys one of the main villains, but it quickly vanishes in time for her to be shot. Her character arc was very poorly developed and never went anywhere. Her powers were also odd as they just randomly appeared for a single scene and then never showed up again. It was as if the writers needed a way to take down one of the main villains and they decided to just make this up. If the powers had transformed Oichi into a good character then I’d be okay with it. As it stands, she basically got her husband murdered and then she went down shortly afterwards. Tokugawa is the worst clan leader. He can’t fight for beans and he continues to work for the Devil King even when he knows that the guy is evil. Naturally Tokugawa gets back stabbed and he would have lost the battle anyway if there wasn’t any interference. While Tokugawa may try to act as if he’s not a villain, he’s just as guilty as the others if you ask me since he’s working with the villains. He may use honor as a justification, but it’s just an excuse. His main general is Tadakatsu, a giant cyborg. This guy is physically very strong and Shingen even claims that Yukimura would not be able to defeat him. I don’t buy into that and I didn’t really believe the fight either, but the general seemed like a decent character. There’s also the wandering warrior Keiji. He’s apparently extremely strong, but prefers to goof off and enjoy life while he can. This guy is critical to uniting the various factions to oppose the Devil King as they probably would not have worked together otherwise. He’s not really my kind of character, but the show portrayed him decently well. A lot of times this character trope ends up being a lot worse. There were some other minor characters in the show like a few clan leaders who showed up out of nowhere, but they’re really not all that important. They got a little bonus OVA episode that explains their involvement a little more, but it just shows that one of them is a villain and the other is another battle hungry leader. I actually liked that guy at least. It makes sense that there are more clans across the sea, but the show really didn’t need to add these guys. While I have some issues with the show that are coming up, they don’t really hurt the show all that much. They’re just things that the writing could have worked on and some viewers may not even notice. The only one that was a little aggravating was the fanservice that would pop up once in a while. It was pretty mild and not too frequent at least, but Kasuga was basically used purely for fanservice. Her outfit is pretty outrageous and I can’t picture a ninja actually using it. I know Marvel’s reasoning for costumes like this for assassins is that they can distract the target which makes the job easier, but that seems more like an excuse than anything else. Whenever Kasuga talks to her boss she makes exaggerated poses as she exclaims her delight. It’s a pretty sad running gag and it’s the only part of the series that has fanservice in it. Take this away and that angle would have been perfect. So, that was definitely a little unfortunate, but I realize that it certainly could have been a lot worse. At the very least, the show never puts any real emphasis on her costume aside from these moments, which could have certainly been a disaster. One thing that the show is comically bad at is the power levels. You get glimpses of this early on, but it gets worse and worse. All right, we know that Yukimura and Masamune are about equal since all of their skirmishes are completely deadlocked and have to be interrupted. They are seen as the absolute strongest warriors even if the leaders would beg to differ. Then we get Nagamasa who is also able to match up to Masamune. Then we get Mitsuhide who has the upper hand against Masamune (He was weakened though) and later on starts to beat Yukimura. The two of them team up and Mitsuhide is still holding his own. That’s when Kojuro shows up and says that he’ll take care of it. He beats Mitsuhide pretty easily, but that shouldn’t be possible since he’s weaker right? 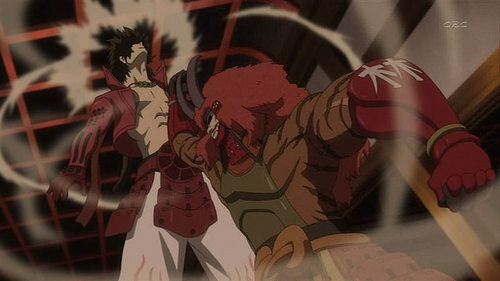 Keiji was also shown to be at around the same level and he also took down one of the big hyped leaders. The problem here is that the show wanted to give everyone a bunch of hype which resulted in all of them being at the same level. It just didn’t make sense and as a result some characters would suddenly look weak for no reason. Yukimura losing to the cyborg for a while in the fight didn’t work for me and Shingen looked really bad against Mitsuhide. It reminded me of LBX, but that show’s probably The most extreme when it comes to power levels so we’re not quite there yet. You’ll also just be able to tell since the visuals are so exaggerated for the two main heroes. They’re making twisters with every hit to launch hundreds of soldiers away one second, but then they can’t dodge a bullet the next. The heroes are cornered by conventional weapons at some points and it makes you wonder how this is possible. Well, that’s because the visuals are more just for entertainment. They’re not actually jumping and staying in the air for whole minutes or cleaving mountains in two, it just feels like they are. At the same time, that’d be kinda sad and some scenes don’t support this as other characters see the battle and feel the tremors. The other explanation is that they can only awaken their powers at some points like in a video game and their normal mode is just really weak. My own theory is just that the power levels are inconsistent and the writers could have handled it better. The show made some odd decisions towards the end. The story was really good and this isn’t necessarily a negative, but the ending had a lot of cop outs. At the beginning, characters were dying left and right, which kept amping up the stakes and it felt like a show where 90% of the cast would die off and there wouldn’t be any room for a second season. I’m inclined to think that the writers just wanted more money and season 2 would give them a chance of that. As such, a ton of characters just randomly survived at the end even when it felt like they should not have. Yukimura’s boss, the ice boss, Masamune’s henchmen, they all felt rather artificial when these characters survived. Allowing them to die would have made the ending a lot more impactful. So, I think this decision did hurt the tone of season 1 a bit, but it could help season 2 a lot since not having all of these characters could have been a little tough. Even Masamune may have died if there was no season 2. Fans of these characters should also be happy since they may get a chance to fight more thanks to this. Finally, I have to point out that the characters in this show have a very distorted version of honor. It’s an old school kind of honor where if you make a deal, you have to stick to it even if nobody else is. An example is how several heroes made a pact with the Devil King and then had to stick to it even while he was murdering their allies and stabbing people in the back. At that point, I’d say that the honorful thing to do is to stop him yourself instead of standing back and aiding him. A lot of characters were confused about that, but at least Shingen and Masamune knew better. Honor like that just isn’t worth it, but you’ll be surprised at how many characters in this series are paralyzed by it. Sengoku Basara definitely doesn’t disappoint with the epic soundtrack. The tunes are all very high octane and full of action which makes all of the scenes that much better. Nobunaga’s theme is absolutely the best one as you’d expect. It’s very atmospheric and perfect for all of his moments. That being said, the hero themes are also really good and the battle themes are exceptional. There are also some lyrical themes which occur during big fights. Basara’s animation was also the real deal. At times it could maybe be a little too stretched out with the attacks though. It’s like watching a 90’s Marvel comic in anime format at times as it’s all very Topsy Turvy. It may seem odd at times, but overall I’d say that it worked really well. The colors are very sharp and it felt like the anime got a pretty high budget overall. At the very least, you could tell that this was as video game adaption right from the start and I do think it should embrace that fact. 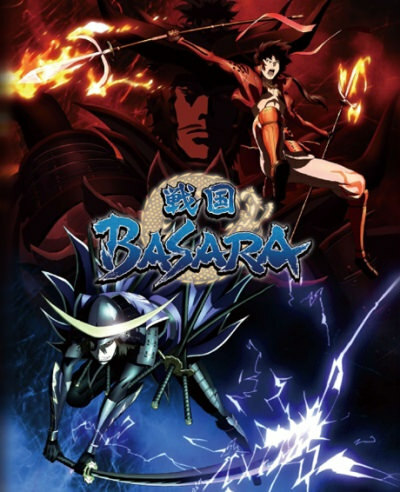 Overall, Sengoku Basara is a pretty great anime. It has a lot of action nonstop and the pacing is really good. I’ve said this many times, but that’s one of the things that I love about 12-13 episode shows. They don’t have to bother with a lot of fillers (typically) or drawn out scenes to buy time. This show just goes all in and never gives you a break to relax. The only real negative here is the fanservice which is fairly limited and the fact that the heroes have horses that they ride into battle. I didn’t really get into it, but there is one scene in particular where a horse dies and that was unfortunate. If it had happened more often, that would have definitely been enough to have really hurt the score. It’s why I heavily advocate against heroes having animals in any capacity as it usually ends up being targeted. Kind of a downer to end the review on that note, but essentially just brace yourself for that scene and the Kasuga shenanigans. Beyond that, the show really hit all of the right notes and I look forward to the next season. This entry was posted in 8 Star TV Shows, Reviews, TV Show Reviews, TV Shows and tagged Action, Anime Review, Capcom, Devil King, Game Adaption, Review, Sengoku Basara, Thriller, TV Show Review, Video Game Adaption, Yukimura by dreager1. Bookmark the permalink.